Our expertise in parallel image processing is ideally suited for meeting the large computing demands in modern medical imaging. High-resolution microscopy images can easily take several GB in size, and high-content screening of microscopy data sets using classical software tools is extremely time-consuming. Using GPU-based parallel computing solutions, we can dramatically cut down processing and waiting times. For example, we have helped the Memorial Sloan Kettering Cancer Center by improving a tool they use daily. Where their analysis previously took one hour, it now takes just two minutes – a speed-up of 30x. Their productivity has gone up at virtually no extra cost as waiting for the results is significantly reduced, without the need to buy new computers. StreamHPC also has experience in high-performance implementations of molecular dynamics simulation software. 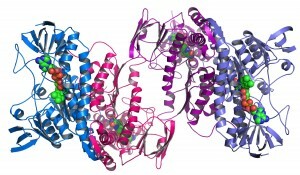 Such software can assist proteomics research in the prediction of protein structure and aid computation drug design in a more rapid drug discovery.